In my experience, the non-V8-sourced Ford T-5's are far more common...and generally MUCH cheaper than their V8 brethren. Unless you're using a seriously breathed-on V6 with lots of torque, or a V8, the non-V8 T5 should work extremely well, and cost a fraction as much. Just make sure that it's a "World-Class" T-5 (produced from 1985 onward), as it has bearings instead of bushings internally, better synchromesh, is stronger, etc. The only downside is that first gear is quite low (3.97:1), although with a tall rear axle that wouldn't be a problem. It's easy to trace which model T-5 it is from the metal tag (about 3"X 3/4") bolted at one end to the left side of the trans - to do so, visit here: http://www.5speeds.com/t5/index.html. Mine, for example, is a 1352-162, identifying it as coming from an '87-'88 Mustang 2.3 liter I-4. You WILL NEED to get this identification, as acquiring correct parts depends on it. Hey guys, anyone familiar with how the different flavours of Zetec translate on this side of the ocean? i.e. do all North American Zetecs share mounting points with the Pinto 2.3l? I'm hoping to fit a 2l Focus SVT Zetec (2002) to either a T5 or Type 9. T5 was fitted to the 2.3l Thunderbird, and 2.3/2.5 Ranger. Type 9 was fitted to the 2.3 in the XR4ti, all of which are easy to scavenge. All North American Zetecs (the Zetec-SE is actually a sigma engine not a Zetec) have the same bellhousing pattern so using the FSVT engine is possible. I had a problem with mine - the pilot bearing (HK1520-2RS) was quite a bit too large for the hole in the end of my crankshaft. Now, my engine is from an automatic, so it's possible that Ford didn't finish-hone the hole for that reason, but in any case, the hole was 20.68 mm, and the bearing is 21.04 mm in diameter. Too much of a difference, IMHO, to just pound it in there without likely causing damage to it. After MUCH online research, I found a thread about someone who used a brake cylinder hone to open up their crankshaft hole (not on a Zetec, but they had the same problem), so I did that, and got the hole up to 20.90 mm. They, I sprayed the daylights out of the bearing with an inverted can of DustOff. That got it down to -68 degrees ( ), and shrunk it to 20.99 mm. They I tapped it into place with a brass drift - went in beautifully! It sure isn't coming back out without a puller, though! I found this while searching for bellhousings for the Zetec motor. the bolt pattern looks right for the motor. so this should convert it to a more plentiful bellhousing. Upon further review, I believe that this adapter will work with the Zetec motor. That should bolt a 5.0 T-5 and bellhousing to a zetec using a $175 adapter plate. That looks promising, and I have a 5.0 Mustang T5 with bell already -- been looking for a 2.3 T5 bell to hack up and re-weld locally without much luck. This setup uses a V8 clutch and flywheel, no? If yes that provides a lot of new possibilities and potential challenges. I suppose just fitting a trigger wheel onto the harmonic damper would be the simple way to go. Any guess on how thick the adapter plate is? They're in England but their shipping estimates aren't too bad -- looks like it would work out a bit cheaper than the $475 Q4R setup, especially once you add the $200 or so for a concentric slave setup. All I really know is that my bellhousing that matches up to my Zetec, matches up to the 6 of those bolts on my 2.3L Lima. I was wondering about the thickness of the plate and shaft length and clutch parts and... and... I'm guessing the company could point you in the right direction if you contact them. I've only looked at their website. Contacting them sounds like a good idea. Following the link to the Stinger flywheel in the install sequence gives you the V8 Mustang clutch info. $335, 11.5 lb ali flywheel -- pretty decent value, and V8 Mustang clutches are inexpensive and plentiful. Called them, plate is 3/8" thick, guy at Canfield wasn't sure if the bottom 6 holes would line up with a Zetec, but they do in your experience, so unless the top of the Mustang bell interferes with the Zetec head it looks like a winner -- might need to carve up a custom, thicker, pilot bush out of bronze. Truth be told, the zetec lines up with 5 bolt holes because when they relocated the starter they removed a mounting "ear" off the block at the 2 O'clock position. Getting ready to do some test fitments of my drivetrain so I can fabricate some motor mounts. My only problem is I need to find a bell housing for my Zetec / T-5 combo. Am I correct in the assumption that the only solution we found that is "bolt-on" was the Quad 4 Rods bell? I should have bought it years ago because now the price after S&H is over $600. I'm having a hard time trying to stomach that price. 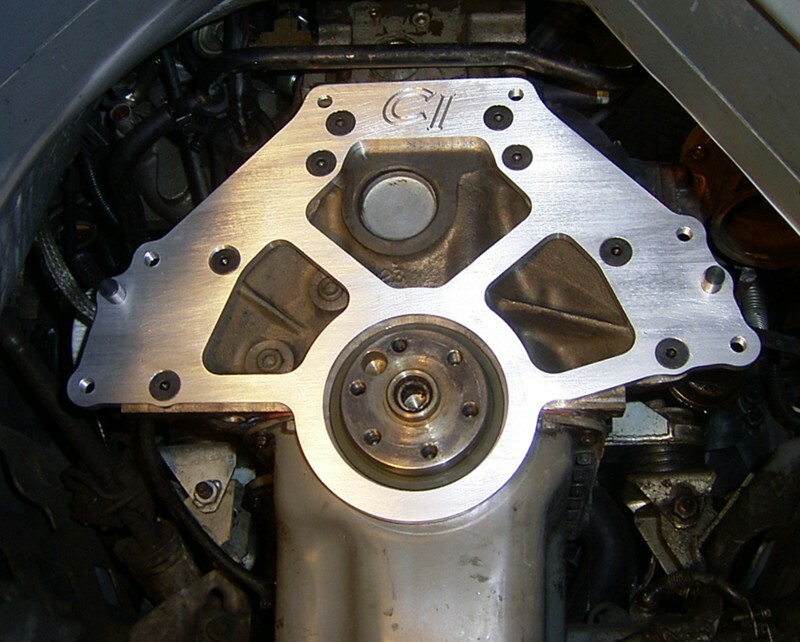 I've ran into a number of bell housings for the Zetec SE overseas to adapt a T-9, but nothing for the NA 2.0 Zetec. I need information on what to get pilot bush and clutch wise. Pilot bearing (its a sealed, permanently lubed roller bearing) was a seriously tight fit in the end of my crankshaft. I suspect that the pockets aren't finish-reamed for engines intended for automatics, and short of removing the crank & having it turned to fit, shrinking the bearing was the easiest way. My crankshaft pocket was .017" undersize! I used cold to shrink the bearing (-250 degrees C), and then it slipped in easily. If you need to do this, PM me, and I'll send you instructions on doing this. Cost to accomplish supercooling = around $3.00. It's also a great way to remove broken steel bolts from aluminum engine blocks, etc. etc. without damaging anything, particularly where using heat would be a problem. Violentblue did a thread on this a while back (okay, it was 6 years ago! ), and figured out that the required bearing is part# HK15202RS . Most industrial bearing places can order the correct one for you, or I just found them on Amazon.com for $12.80. http://www.amazon.com/INA-HK15202RS-Bea ... B007D34152 You'll only ever need just one. Clutch was a Mustang II unit, I believe for the 4-cyl version, as it was the correct diameter. Im working on getting a hydro throw out bearing set up for the Ford T5 right now. The only hang up is the pilot. Was I correct in reading that the V8 input is slimmer than the I4 input on the T5? I am going to do some motor work to it (since I will be running a turbo) so having the pocket enlarged wont be too big of a deal I would think. I just want something that is close to begin with. Also, does the Zetec run the pilot bush in the flywheel? Did I read that correctly?